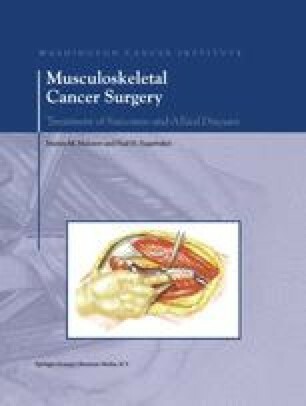 Above-knee amputation is most often performed for advanced soft-tissue sarcomas of the distal thigh and leg, or for primary bone sarcomas of the distal femur and proximal tibia. It is usually indicated because of major involvement of the main neurovascular bundle or the presence of an extensive involvement of the soft tissues. Above-knee amputations may be performed through the distal aspect of the femur (supracondylar), the middle section of the femur (diaphyseal), or just below the lesser trochanter (high above-knee). The clinical and surgical considerations surrounding above-knee amputations, as well as details of the surgical technique, are described in this chapter. Emphasis is on flap design and meticulous dissection, use of continuous epineural analgesia, myodesis of the major muscle groups to the distal femur, meticulous wound closure, and application of a rigid dressing.